Feast Journey - Mumbai - Ghumakkar - Inspiring travel experiences. Mumbai Meri Jaan …. Mukesh Bhalse has written a series of post, which is giving a good description of tourist attractions of Mumbai. So I thought of why not I write a post, which gives a glimpse of the food being served in various locations of Mumbai to my fellow Ghummkars. I am being a foodie and writing about the food does seem a better option for me. Now the point where to start the feast and I will recommend Seekh Kawab, the softest Seekh Kawab I ever had in my life. They are grilled on the Charcoal fire and served hot, the shine on the surface due the juices flowing from it reflects the quality served. I bet you cannot stop with one plate of the Seekh Kawab and end up having couple of them. After this, one can go for the Tangadi Kawab, dark on outside but soft and juicy inside. In main course one should definitely order Chicken Bhuna , highly recommended. It is a Tawa item so is on a bit Dry side, chicken pieces cooked in the Spices (Which are always have been the best kept secret) with some dry fruits . Served hot and is spicy, rumaali roti gives a good company to it. After the sumptuous meal bill for two will be around Rs500 hundred which is a bit on the higher side but again the taste of the food will not make you feel the pinch . 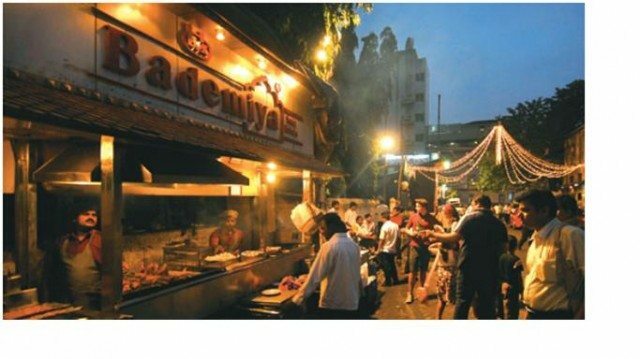 How to reach there, go to Colaba and ask anybody, everybody knows where bade miyan is located in Colaba. It opens in the evening only as it is been run on a Redy/Thella .People having a car can park the car on the road leading to the joint and place the order, food will be served and bonnet or the dickey of the car can be utilized as table . Places to see near are, Gateway of India, Hotel Taj , Colaba Causeway <For Shopping>, Marine Drive and Nariman point are around a KM from here . So my suggestion will be to Visit the Gateway of India first or one can go to Elephenta caves by Ferries running every 15 Minutes. Have a late night meal at Bade Miyan and then go for a stroll on Marine drive, believe me this will be the perfect evening. 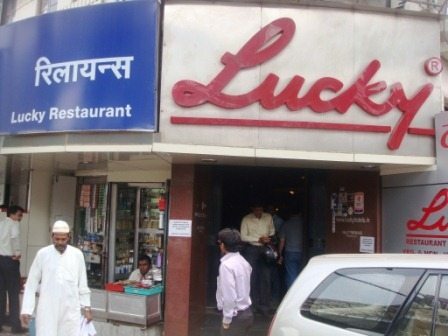 Second on my list is Lucky Restaurant, again a non-veg food delight , I am really sorry for my fellow Veg Ghumakkars. Chicken Biryani , highly and may be the only recommendation in Lucky . Normally the Biryani ends at 9.30 or so and I have seen people leaving the restaurant when they come to know that the Biryani is over. Chicken is marinated to level that is softer then butter, it melts in the mouth. They prepare this Biryan in a big handi using again the secret spices. I have never tried mutton biryani but that can be given a try. They also serve various types of Kawabs and other gravy items. Lucky restaurant is located in Bandra, West, it is bang opposite to the Bandra station. People visiting Mumbai as tourist can also visit Band Stand, which is not far from here. One can see the famous Bandra Worli See link from Bandra Fort, which is located on the Bandstand. As I stay in Navi Mumbai, I couldn’t find any good restaurants which serve good non veg food . But one day I ended up landing in Golden Punjab restaurant located in Sector 17 Vashi. It is good for both Veg and non-Veg food. For non-Veg again Tangadi kabab is a very good option to start with . Two pieces with juice flowing from it , very well marinated and soft . In main course one can have Murg Kadai or Murg Amritsari , spicy but it goes easy on your tongue. For Veg , Dal Makhani is must order dish , though I have not tasted an authentic Dal Makhani in my life but I can guess that this is up there in the competition with the authentic one , prepared in the Punjabi homes. Vashi Railway station located around a couple of kilo meters from here is a place to visit . Huge station built to acoomodate offices on the upper levels. On all the railway stations of Navi Mumbai , hawakers are not allowed so the platforms can be kept clean . So after so much Non veg stuff I wanted to take you all to a pure Veg restaurant, Bahagat Tarachand located in Sanpada , Navi Mumbai . However, I am being a non-Veg foodie but have been to this restaurant umpteenth number of times. I do not know which type of cuisine they serve but somehow I guess it is Marwari food anyway I do not feel the type of cuisine matters a lot when the food is good. Again can be started with the Papad Chura or with a Masala Papad . In the Main course you can have anything which are commonly served in the various restaurants but believe me it is far better than the other restaurants offerings. To recommend a few items, butter Paneer , Mutter Paneer , Veg fry , Dal Makhani etc. Now how can I conclude this without giving my recommendation, my favorite is the Sarso ka Saag with Makai ki Roti , though available on seasonal basis but it is worth giving a try . Also last but not the least they serve Chaas (Butter Milk) in Bear Bottles and it is refreshing. How to reach their, go to Sanpada Navi Mumbai and ask anyone about where Bahagat Tarachand restaurant is located and every one can guide you. People travelling from Mumbai to a location down south can take a stop here and have the food before heading down. I am listing down the restaurants, which serves delicious food, but I am not a regular visitor but have been for couple of times. Britanica and Company – Located in the Ballard pear , Mumbai it is very near to the CST station. One can take a taxi and reach there in the minimum fare . This is a very old Parsi restaurant and opens only in Afternoon , no dinner here . Closed on Sunday’s , as it is located in the middle of many corporate running their offices from Ballard pear so I guess this restaurant operates to suite the office timings. Good to have here is Beri ka Pulaw , amazing is the word I used when I had it for the first time . They import these berries from Iran. Apart from this they serve all other Persian delicacies like patra-nu-machi (steamed fish in leaves), chicken & mutton dhansak, chicken cutlets, Caramel Custards. The good part is for every Non veg dish they have got a similar veg dish available , though I have never treid any Veg Dish over here. Tejab Movie was shot here :- The sequence where Chuncky Pandey takes his guys for the lunch and a Parsi baba end up paying bills for them . All the furniture’s used here are imported pre world war II and they are still in use. This restaurant run by two Parsi brothers, who are around 80-85 Years old, death is inevitable and unfortunately when they go for rest in peace this restaurant will be shut, Sad but True. Located in the various locations of Mumbai they claim to serve authentic Mughlai food , they are good but not the best . 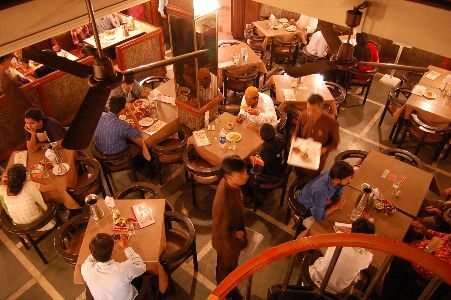 More details can be found at the website http://www.jafferbhaisdelhidarbar.com/. This is a chain of restaurants located across the mumbai , few locations I know are Fort(Near to CST station), Thane(Near Cadbury Junction), Juhu(Near Marriots Hotel). They are specialized in Seafoods and serves preparations made with Fish, Prawns, and Crabs. However, my favorite is Butter chicken, whenever I place the order of Butter Chicken the waiter gives a surprising look, because majority of the people visits the restaurants for Sea Food. The restaurant is on a bit higher side w.r.t to price, a meal for two will range from Rs800 to Rs1200, depending upon the order been placed. The food joints I have mentioned above are my personal favorites and I don’t have any stack in any one of them .:). I wanted to give some insights about good food served in Mumbai; there are many more restaurants located across Mumbai, which are serving good food, but I am not aware of them. The hunt is on and as they say “ Pet ke liye bahut kuch karana padata hai ..” . Thanks for your valuable inputs… I’m raring to go to the restaurants that you have narrated in the blog.. Sounds really interesting.. (err or should I say yummy?). Keep up the good work of keeping us (not so Ghumakkars) informed.. 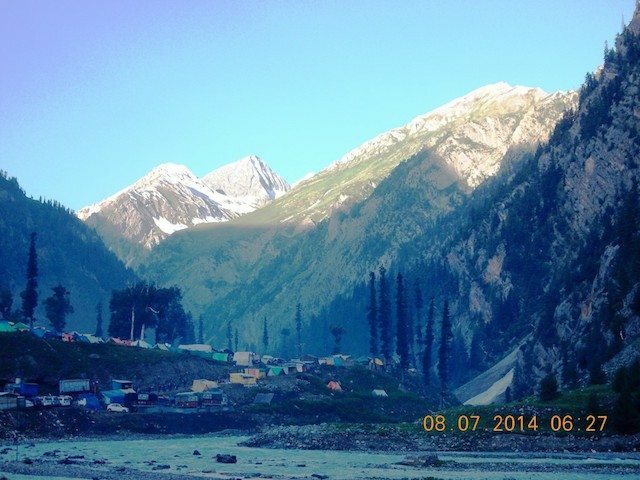 Thanks Pradeep and you are the first person to comment on my first post. Started working on the new post and you will see it as soon as it is completed. First of all a warm Welcome as an author to ghumakkar. Secondly the effort you put in preparation of this post is really appreciable. Its really a very good post for the people who are in quest of good food in Mumbai. Keep writing here………………………Waiting for another flower from your beautiful bouquet. Thanks Mukesh for the the warm welcome . Will be attached with this family by sharing the travel experiences with you all. i’v never been to Mumbai but definiately visit to these places once i will there. ..!! Yogesh , yes you will enjoy the food served in these restaurants . Thanks a lot for the encouraging words. Being a Veggie your details were not that useful for me but the idea of presenting your fav food joint of Mumbai was brilliant. Thanks a lot Mukesh for the encouragement , this will make me to write more about my travelling experiences . My wife is a very good cook so I don’t prefer eating Veg in restaurants , that is the reason for my post being primarily Non Veg . Being a Veggie your details were not that useful for me but the idea of presenting your fav food joints of Mumbai was brilliant. Welcome to Ghumakkar . You are writing a post on which you can write endless series. Good and informative description on the topic which you have covered. Vishal, I agree with you we can write endless series on Food and travel. Your good words are encouraging. I am reading your post at work and it is almost lunch time. It is indeed a mouth watering read. What I found interesting was that you listed places of attraction near by the food joint. I quite like the idea of first having a nice meal and the set out for sight seeing. ???? ??? ??? ?, ??? ??? ???? .. I am humbled by your ‘bio’ where you write that you have read every post in last two years. Thank you from entire Ghumakkar community. A nice and well organized collection of food joints with enough of travel related information, from nearby places to google maps. There are a lot of foodies here (Shubham Sarkar, Venkatt and more) so I am hoping that this log catches their fancy. Look forward to your next story and welcome once more. Thanks Nandan for the kind words. Will surely be attached with this family with more write ups. Very good description and phtotos , maps so good. Thanks for it.